It is a kind of performance to show the different kinds of feats to climb a slope pole upwardly, inversely or climb in circles to fetch the things on it. 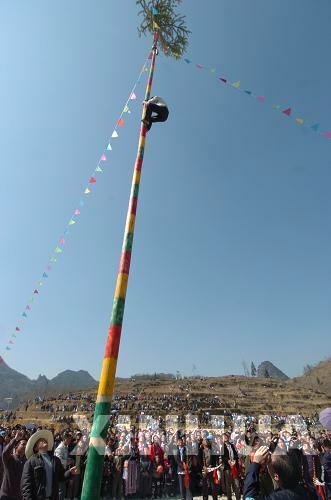 Every year the Miao Ethnic Group has a fair to hold a pole climbing game. A 10-meter tung pole is erected in the fair place with preserved ham, rice wine and Ciba (a kind of cooked glutinous rice pounded into paste) hanging on the top. All the participators should climb up to the top and drink a mouthful wine and down. The most mirable of this game is that almost all the climbers are using their own feats to show their special skills and athletic abilities, some only climbing by using the hands and others by using both hands and feet, some climbing upwardly and the others reversely with the feet upward; moreover, some even circumvolving while climbing…. At this time, all the young people around the pole are singing and dancing and cheeri ng for the climbers, and everything there presents a happy ambience.